Devastation Day and Amy’s birthday are now behind me and I can return to just grieving and missing Amy without the pressure of those two painful days looming over my head. It makes perfect sense that Amy’s birthday was much more difficult to handle than Devastation Day because of the precious memories of past birthdays and our celebrations together. The day Amy was born was such a joyful day in my life. Memories are all we have but it still hurts to remember. During the past two weeks, I have found myself sobbing more each time I allowed the reality of her name on a tombstone with those two significant dates to sink in. Our lunch with the Sisters of the Blessed Sacrament was lovely and the lap blankets and shawls were well received. As I shared with them why I had sewn a feather on the bottom of each lap blanket or shawl, they shared with us what the word feather meant to St Katharine Drexel as well as their own personal meaning of a feather. It made me pause and wonder how Amy and I had selected that word. Tomorrow I will return to work after being out of the office for two weeks. Many will view that time off as a “vacation” which is understandable yet also irritating. However, to their credit, my daughter’s death and birthday is not on their minds and all they will be thinking is that there was an empty chair for 2 weeks so “lucky me” to be on “vacation” for two weeks. Spending time at the beach sounds vacation-like. Vacation and joy go together. Grieving — vacation … No, it was not a vacation. Actually it was exhausting but I am grateful for the time off to get through these two dates and the emotions which surrounded those two days. But what do you say when people ask you “how was your vacation”? It was almost like that “how are you” question four weeks after my daughter died when I returned to work. Are you freaking kidding me? How am I? Guess I’ll just answer the vacation question with I needed some time off… Oh yeah, I am supposed to let them say whatever and let it roll off my back. Fat freaking chance of that. But I will try, whenever possible, to be prepared with an answer now that I should be so much better since I made it through the worst year of my life. Sarcasm, but seriously … My heart has not magically healed! I am just a better actress and have become more accustomed to living with a 2 ton elephant sitting on my heart. 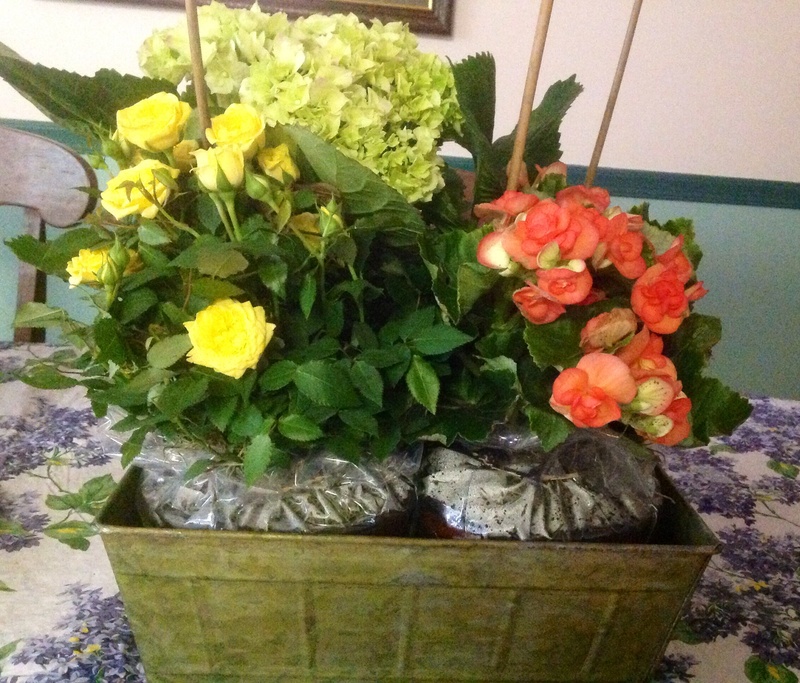 Before we left to meet our son and daughter for dinner last night – a way to be together to honor their sister’s birthday — I received a surprise large box in the mail which was loaded with four beautiful pots of flowers along with a large container. Much to my surprise, it came from Amy’s co-workers with a simple note: “Your Amy remains in our hearts.” It was a reminder I needed more than I realized that they had not forgotten Amy. It moved me in a way I cannot put into words because other than one of her best friends who still works there, maybe I thought they had forgotten all about Amy. You know the out of sight, out of mind thing. Amy loved her job and loved the people she worked with so receiving that thoughtful gift yesterday on Amy’s birthday meant so much to me because they remembered Amy. My office is right up the street from Amy’s, and I am still unable to look at her office building. An office building which housed the company she was so happy to be a part of and one where she was Employee of the Year! As one of my friends mentioned a month or two ago, I truly have spent the past year doing deeds and asking others to remember my Amy. I use this blog to release the pain but do not share too many details about Amy because as I reflect on this wonderful young woman, it serves as a reminder of all that I have lost which was wrapped up into my relationship with my daughter, my best friend, my confidante, my voice of reason, my biggest fan. Ask anyone who knew us and they would validate the special bond I had with my youngest child. One year later and I cannot look at my life without her, without falling apart at the stark reality of who Amy was to me. In a grief class we took 6 weeks after Amy passed away, they asked us to reflect on how our identity had changed after losing our loved one. My husband started to cry when he reflected on how my identity had changed because Amy and I were kindred spirits and very intertwined. Not to diminish his relationship with Amy because they adored each other, but he knew and watch us together and he realized what losing Amy had done to me personally. I am shattered. There is no way I can ever pick up all of the pieces and just carry on, but I haven’t given up and as hard as it is to keep going, I do. And for the umpteenth time, no one ever needs to remind me that I have other children because I see them, hear them and have not retreated from their lives. So it continues … the second year without Amy. The world keeps on turning which makes no sense to me. I still cry every day, numerous times. The adrenaline is no longer helping me to keep moving and I am worn out and tired. I am afraid to stop so I keep on moving. Onto the next way to honor the spirit and memory of Amy. I have looked up from my life long enough to noticed the wonderful people who care and show it. I have hung up all of the beautiful cards and notes we received from Devastation Day through Amy’s birthday as a reminder that we are not alone! Grateful to those who reached out to my children too. Grateful to those who visited us. Grateful to those who stuck around this past year. Grateful to the other grieving parents for their comfort and support and the beautiful ways they remembered Amy. I will always remember your children too. I promise. Remembering Amy today and forever. Your blog always hits home. Arch’s thoughtfulness touched my heart. I know Amy was over my shoulder reading the words they included with the beautiful flowers. I’m sure she was smiling. Dear Dee, you already know how similar our worlds are now. I wish more than anything that I could wipe all this away for all of us, but I can’t. Instead, I can only say I’m always here to be a shoulder and an ear, and I will always remember Amy. I truly believe she and Melinda are together. Wishing you peaceful days as you return to work and the strength to deal with questions and comments of others who can’t possibly understand what their words actually mean. Take care my friend. Thank you so much, Mira. Your support means a lot to me and I agree our girls have connected us. Wish it was under different circumstances. I am reminded of my own journey when I read your pain – yes I can read the pain and feel because I too have felt it. You’re still so fresh in your journey and I wanted you to know I am reading your blog and praying that in this medium you can feel some relief from the weight of this grief. It has always helped me and while I don’t write as often now, it’s just as emotional each time I write. Sending you hugs. I always appreciate your comments and support. You give me hope maybe some day it won’t hurt this much. Thank you!